Frequent visitors to this website know that one of my soapbox issues is the homogeneity of today's movies. Everything is a copy of everything else or some sort of replication of something which has been successful in the past. You have to search to find something truly different, as even little "independent" movies still feel like the same old thing. The notion of seeing a big-budget film which actually does something daring seems incredibly far-fetched at this point in time. Well, someone went and made something different. Very different. And Max Max: Fury Road proves that different can be good. Mad Max: Fury Road takes us back to the post-apocalyptic world of Max Rockatansky (Tom Hardy), a nomad who wanders the wastelands in his hot rod. As the film opens, Max is attacked and captured by a group of marauders. He is taken to an elaborate fortress which is inside of a massive chain of mountains which is overseen by Immortan Joe (Hugh Keays-Byrne). This bizarre world is overrun with "War Boys", a group of young men who worship cars. The peasants live in poverty, and are only occasionally given water by their dictator. Max has been captured in order to serve as a "blood bag" for the War Boys, who require blood transfusions. (For reasons which are never disclosed.) Immortan Joe dispatches his greatest driver, Imperator Furiosa (Charlize Theron), to take a convoy to Gas Town to gather fuel. But, Furiosa hasn't been on the road very long when she takes an unplanned detour. Joe sends a group of War Boys to check on this and as Nux (Nicholas Hoult) hasn't finished his blood work, he straps Max to the hood of his car and takes the helpless man with him. Max soon finds himself involved in a grueling chase across the desert as Furiosa's plan unfolds. Well, apparently someone got a memo to Director George Miller about this fact, as Mad Max: Fury Road is rarely, if ever boring. The 70-year old director has re-imagined his franchise and packed it with wall-to-wall action. It only take mere moments for the first car chase to begin, and following a very brief lull to introduce the characters at The Citadel, the movie is off and running again, rarely pausing to take a breath. OK, so it's got action, so what? This action is live-action. Unlike so many of today's films, there was minimal CGI used in the making of Mad Max: Fury Road. What we get are real people driving real cars which are really flying all over the place. It's very rare in today's cinematic world where we watch a film and wonder how they did that without someone getting hurt (or worse), but that is certainly the case here. The other key to the action is the variety of action. As the convoy moves through the desert, they are attacked by a growingly bizarre group of threats. At first, it is simply cars...weird-looking cars, but cars. Then motorcycles join the mix. From there, the list of assailants grows to include cars and trucks with bizarre modifications intended for stopping other vehicles. By the finale, we are treated to Cirque de Soleil-type stunts involving cars. And, let's not forget the fact that Immortan Joe likes to listen to music while he drives. Of course, this music is coming from a truck loaded with drummers and a freak playing guitar. To say that the overall look of the vehicles involved in Mad Max: Fury Road is creative would an understatement. From beginning to end, Mad Max: Fury Road is a wild ride. Of course, when it's done you'll realize that you didn't understand everything that was happening or why anyone was doing what they did, but that's OK. Trust me when I say that you've never seen a movie quite like this. Tom Hardy is good as Max, but he's basically a background character, doing very little and saying even less. Charlize Theron is actually the star of the film, as she gives another turn in which her natural beauty is downplayed. No, now that I think about it, the real star of the movie is the action. There is enough of a story, much of which has to do with female empowerment, to appeal to a broad audience, but I think that everyone will be blown away by the stunts. Mad Max: Fury Road spray paints its mouth...for some reason...on Blu-ray Disc courtesy of Warner Home Video. The film has been letterboxed at 2.35:1 and the Disc contains an AVC 1080p HD transfer which runs at an average of 28 Mbps. The image is incredibly sharp and clear, showing no overt grain and no defects from the source materials. The film is filled with beige backgrounds and landscapes, so we don't get a lot of bold colors here, but the few that appear look good. The image is never overly dark or bright, which is good, as things could have easily looked bleached-out here. The picture shows a great deal of depth, even in the 2D version, and the level of detail is impeccable, as the image never goes soft. The Disc carries a Dolby TrueHD 7.1 audio track which runs at 48 kHz and an average of 6.0 Mbps. The track provides clear dialogue and sound effects. As with the action, the bold audio starts at the beginning, filling the speakers with detailed surround sound and thunderous subwoofer action. These effects are nearly non-stop as the rear of engines come from all sides and show good details. This set also includes a Blu-ray 3D where the film has been letterboxed at 2.35:1 and the Disc offers a MVC 1080p HD 3D transfer which runs at an average of 25/8 Mbps. The image shows a nice amount of depth, but the problem here is that much of the film is comprised of landscape shots which do not have a nicely defined foreground and background. Therefore, only medium and close-up shots give us good 3D effects. It should also be noted that this disc offers only a Dolby Digital 5.1 track. The Mad Max: Fury Road Blu-ray Disc contains several extra features. "Maximum Fury: Filming Fury Road" (29 minutes) takes us behind-the-scenes to see how the film was planned and shot. Through comments from the actors and creative team, peaks at storyboards, and on-set footage, we see the work which went into the driving stunts. "Max Max: Fury on Four Wheels" (23 minutes) examines the various cars in the film, starting with drawings and moving into real-life behemoths. "The Road Warriors: Max and Furiosa" (11 minutes) examines the film's two main characters, and offers comments from Hardy and Theron. The look of the film, including the sets and the props, are examined in "The Tools of the Wasteland" (15 minutes). "The Five Wives: So Shiny, So Chrome" (11 minutes) offers interviews with the actresses who play the five wives and rehearsal footage. 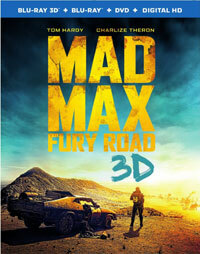 "Fury Road: Crash & Smash" (4 minutes) is a reel of raw footage showing the cars in action and various stunts. The Disc contains three DELETED SCENES which run about three minutes. 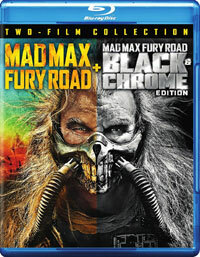 On December 6, 2016, Warner Home Video released the Mad Max: Fury Road + Mad Max: Fury Road: Black & Chrome Edition Blu-ray Disc. This Double Feature release contains the exact same Blu-ray Disc as described above, with the same transfer and extra features. The new attraction here is the film Mad Max: Fury Road presented in black & white. In the 97-second introduction provided by Director George Miller (which is the only extra feature on this Disc), he explains that during the making of The Road Warrior, he saw a work print of that film in black & white, which gave him the idea of giving his latest creation the monochrome treatment. The film has been letterboxed at 2.35:1 and the Disc contains an AVC 1080p HD transfer which runs at an average of 23 Mbps. The black & white image is very sharp and clear, showing only mild grain at times and no defects from the source materials. The depth is good in some shots, but others look flat. The level of detail is good and the image is never soft. This is certainly an interesting idea, but I feel that the black & white version robs the film of some of its power. The original version created a great (and clearly intentional) dichotomy between the bleak earthtones of the desert and the bold greens which appears in the movie. The Disc carries a Dolby TrueHD 7.1 audio track which runs at 48 kHz and an average of 6.0 Mbps. The track provides clear dialogue and sound effects. This is a powerful track which provides deep, rumbling subwoofer from the vehicles. The surround sound effects are nearly constant during the action sequences, as we get detailed effects which offer distinct sounds. Likewise, the stereo effects show great separation.